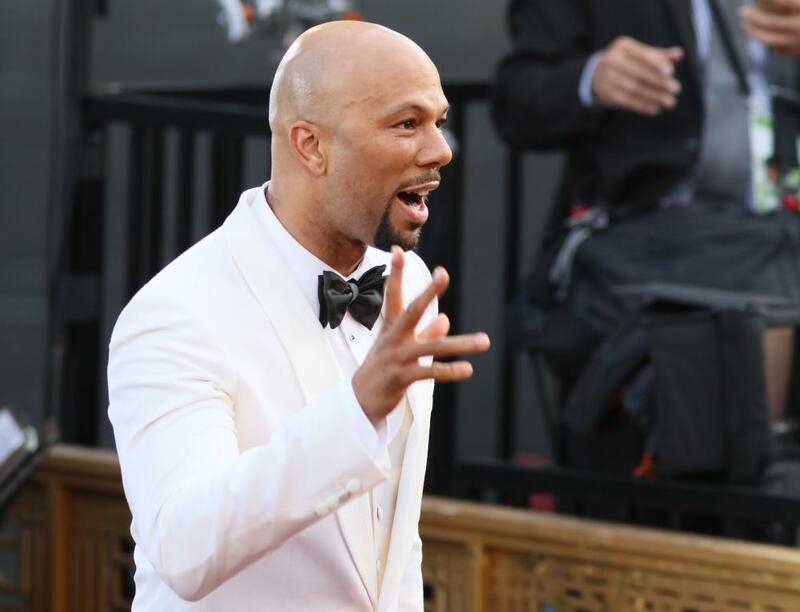 If you’re a man on the red carpet, it’s not really hard to stand out from the crowd. Just do something, anything interesting and you’ll look better than 95% of the identikit tuxedos and haircuts that troll around the best sound editing category. Sadly, no one went full on Adam Duritz or Dennis Rodman. Instead, the biggest menswear trend was standing out with the subtlest of details. Here are six tiny style flourishes which made our night. Style envelope-pushers Alexa Chung and Harry Styles have been spotted ditching their denim for floral ensembles. 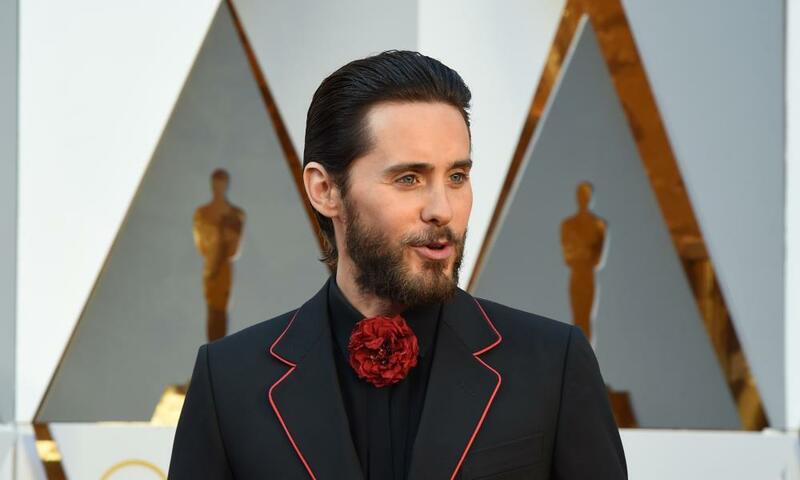 So it’s no surprise that Jared Leto – a man whose red carpet style says: “this is an ironic art project, and you are all my paying audience” – took it upon himself to debut a neck corsage on the Oscars’ red carpet. The black and red of his suit suggested both the staff outfit at your local bowling lane and a souped up flamenco dancer “on one”. Wear sunglasses indoors and people look at you like you are in a full-time relationship with your mirror. Wear them on the red carpet and you’re channelling Jack Nicholson, AKA His Royal Highness of Cool. But Hardy’s shades were one stylistic touch too far. With his spotty goatee, banker’s smile and raver-gone-wrong hairdo, he was more Tom from Myspace than Tom Hardy from the movies. The black tuxedo is classic. It’s also a safe bet, perfect for the non-risk-taking, fourth-in-line-for-best-supporting-actor-type people. Fine, but not particularly memorable. 2016’s most memorable tuxedos were all in statement colours: white Dolce & Gabbana (as worn by cool as a cucumber Common), blue and black (Mark Ruffalo looking dignified in his two toned suit), monochrome (Ryan Gosling mixing it up in a white bow tie) and blue (American footballer Aaron Rodgers). Red-carpet shoes for men have long been a fashion flatline. We’ve seen mankles before, and this year Pharrell showed he was unequalled master of the rolled up hem and moisturised ankle. But it was the trend for slipper wearing that distracted for all the right reasons. Posh gentleman’s club slippers appeared on the feet of fashion forward teenager Abraham Attah and Jared Leto who made the red carpet look like his bedroom carpet in his snake motif Gucci slippers. 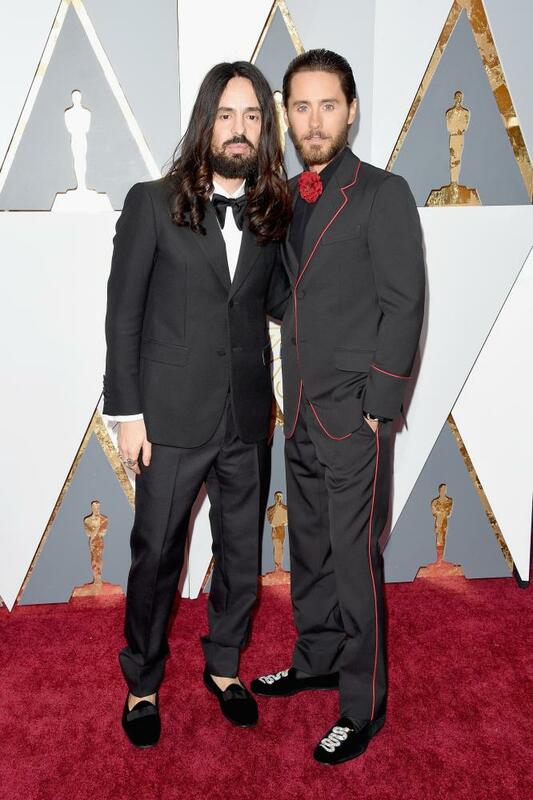 Extra fashion points for Leto for being photographed next to Gucci designer Alessandro Michele. Menswear has pretty narrow parameters. How to stand out quickly in a tux? 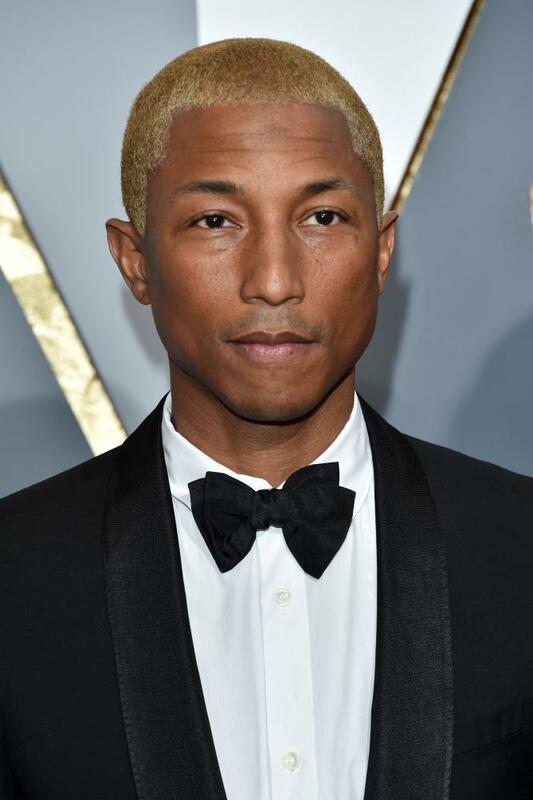 Pharell knows that reaching for the bleach is a tried and tested approach – ask Instagram male supermodel Lucky Blue Smith, and Zayn Malik. #oscarsobleach. It’s a red carpet fact that some appearances are more fabulous that the sum of their parts. Which is clearly why Leo decided to share his red carpet entrance with Kate Winslet in a none too subtle reminder of where his thesp brand began.